The reigning World Champions, Italy, failed to qualify for Euro ’84. They were joined in the international wilderness by the Dutch, who with only one qualification match remaining, had a foot in the finals. Spain was arduously tasked with having to score 11 goals against Malta in order to overtake Le Oranje for top spot and despite a perilous 3-1 half-time score line, miraculously scored nine unanswered goals in the second half to win 12-1. 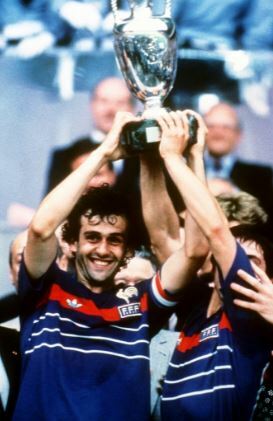 The finals themselves were dominated by France’s Michel Platini. Before disgracing himself at UEFA, Platini was a slender, multiple Ballon d’Or-winning superstar and he comprehensively showcased his supreme talents at Euro ’84. The Frenchman scored nine goals, including two hat-tricks, as Les Bleus were crowned Kings of Europe. Still smarting from their luckless World Cup semi-final loss two years earlier, the free scoring French were worthy winners—netting 15 goals in five matches. Their coach, Michel Hidalgo, developed a philosophy renowned for playing attractive football and ensured his players were technically strong. By doing so he created a system where he could accommodate multiple playmakers in his midfield. During the finals group stages, France accumulated a 100 percent winning record with their highlight being a 5-0 win over Romania. In the semi-finals they faced a tough Portugal side who ran them right to the wire but Platini’s 119th minute winner sent the French through to the final. Les Bleus would then face Spain and La Roja had only won one match in four—en route to the final. Their solitary win came in their group against West Germany, courtesy of Antonio Maceda’s injury-time winner. Against Denmark in the semi-finals they were deadlocked 1-1 after extra-time and Dane Preben Elkjær sent his spot kick high to send Spain through to the final. The final was held in Paris and in a packed Parc des Princes stadium, Platini led the way and the hosts won 2-0 to give France their maiden team sporting title. If Penanka scored an iconic penalty in the 1976 final, Marco van Basten’s incredible volley in ’88 is rarely omitted from greatest goals compilations. The Netherlands’ experienced its finest hour during 1988. Having marginally missed out on the previous tournament due to Spain’s unlikely heroics against Malta, the Dutch made no mistake four years later—ruthlessly dropping just two points during qualification. Hosts West Germany were runners-up at the 1986 World Cup and given their obvious home advantage were considered favourites for the tournament. Coached by legendary player Franz Beckenbauer and having breakthrough players such as Jurgen Klinsmann on board they met another heavyweight, Italy, in their first Group 1 match which ended in a 1-1 draw. Both sides would beat Denmark and Spain in their remaining matches to finish level on points. In Group 2, the Soviets failed to read the script as they beat Holland 1-0 in Cologne. 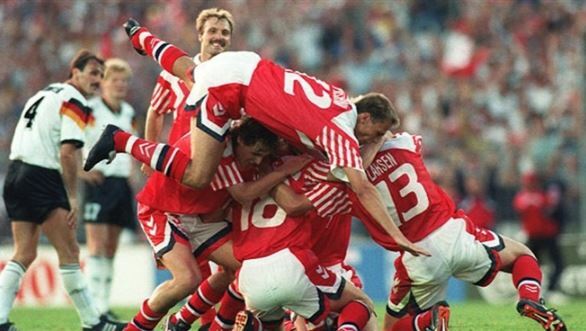 However, van Basten came alive in the next match with a hat-trick to see off England 3-1. A follow-up win against the Irish meant the Dutch qualified but would face their biggest rivals West Germany in the semi-finals. The Germans opened the scoring with a Lothar Matthaus penalty in the 55th minute. Ronald Koeman soon equalised, also from the spot, and van Basten broke German hearts with a cool poacher’s finish in the 88th minute. The Soviets beat Italy 2-0 in their semi-final to set up a rematch of the first Group 1 game. Milan’s Ruud Gullit opened the scoring with a bullet header before Serie A club mate van Basten scored a spectacular volley to put the final out of reach. 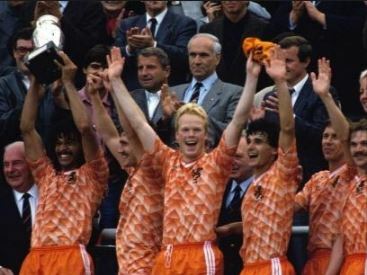 Gullit raised the Henri Delaunay trophy aloft as Holland celebrated a maiden international trophy. Civil war had erupted in the Balkans and due to international sanctions Yugoslavia were expelled from the finals. Denmark, finished runners-up in their qualifying group, were named as the replacements. Both Scotland and Sweden (hosts) made their debuts in 1992, as did a unified Germany. The Soviets were then-known as the CIS (Commonwealth of Independent States) following the dissolution of the USSR. 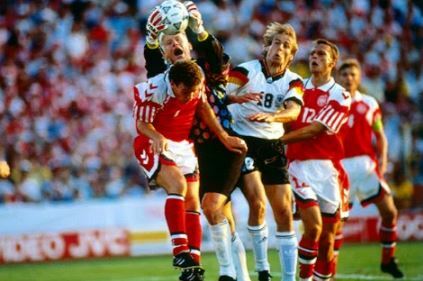 Respective defending World Champions and European Champions, the Germans and Dutch, were again paired together (in Group 2) and thus continued their rivalry from Euro ‘88 and the 1990 World Cup. Denis Bergkamp sealed a 3-1 win to ensure the Dutch took top spot in the group. In Group 1, the Danes started slowly as they drew with England 0-0 and then lost to hosts Sweden 1-0. The Swedes, boasting an upcoming but formidable strike partnership of Thomas Brolin and Martin Dahlin, eliminated England in the final group game 2-1. Meanwhile, Denmark beat France (this was a shock due to Les Bleus’ 100 percent qualifying record) to reach the last four. Marco van Basten wasn’t at his best as a consequence of recurring injuries but he continued to be a threat. However Denmark, led by the heroics of goalkeeper Peter Schmeichel, drew 2-2 and beat the Dutch thanks to penalties as the Manchester United stopper saved the Milan forward’s spot kick. In Solna, Germany knocked-out Sweden 3-2 with Karl-Heinz Riedle netting a brace. 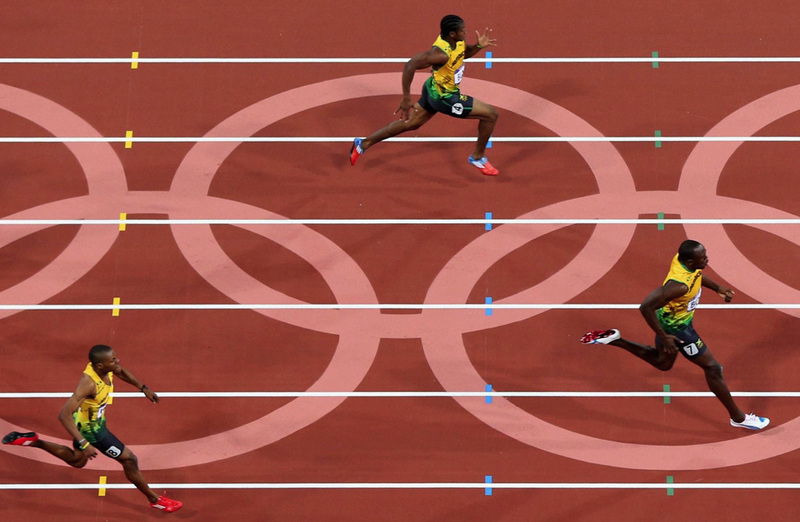 The Danes would then meet the Germans in the final to continue their improbable dream. John Jensen scored a rare thunderbolt early in the first half—he scored only 12 goals in 400 career matches—and Schmeichel repelled the German threat until Kim Vilfort added a second to seal an unlikely triumph.